Head off-the-beaten track in the unspoiled, wildly beautiful parts of northern Laos and Thailand. On this enthralling cross-border adventure, explore remote mountains, rivers and diverse ethnic communities by way of kayak, bicycle and four-wheel drive. In mountainous northern Laos, we set-off from Luang Prabang, an ancient royal capital and UNESCO World Heritage town. 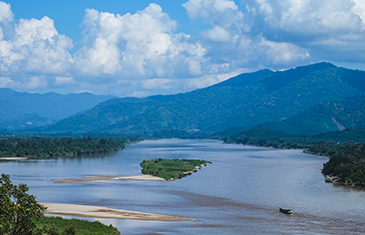 Our drive closely follows the meandering Mekong River, heading northwards via Oudomxay to Muang La. 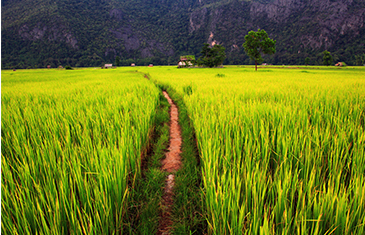 Enroute, marvel at the spectacular scenery of verdant forested mountains and rice paddies. We make a stop at the revered Pak Ou Caves. Perched high on a river cliff, where the Nam Ou and Mekong rivers converge, these limestone grottoes house more than 4,000 Buddhist statues and images, all of which are diverse in shape, size and form. Worshippers, including Lao royalty, have visited this revered cave-temple for centuries. Nestled beside the Nam Phak River and surrounded by rolling mountains, Muang La is a little-visited, yet scenic town. It makes an ideal base to explore the outlying picturesque landscapes of tranquil farmlands and ethnic villages. We spend a memorable day in the mountainous regions of northern Laos. An off-the-beaten track journey by four-wheel drive takes us deep into remote countryside. Explore two isolated villages inhabited by the ethnic minority Ikhos people, who originate from Yunnan and the Tibet H’mong, who have roots in Tibet. Here, observe age-old traditions and gain greater insight into the villager’s daily lives, customs and traditions. Climb 1,000m (3,280ft) for panoramic views over this spectacular landscape and enjoy a mountain-high picnic lunch. Drive through remote countryside to Luang Namtha along a scenic road, running through soaring mountainous terrain and rustic villages. Nestled in the northwestern corner of Laos, not far from the Chinese border, Luang Namtha is home to a distinct number of ethnic minority groups. The self-named province is one of Southeast Asia’s most ethnically diverse areas, including the Akha, Yao and Tai Dam ethnic groups. On arrival, stroll through the exotic night market and sample some of the local delicacies, including delicious khao soi noodles. Once again, charming Luang Namtha makes an excellent base for forays deep into the surrounding natural wilderness, including the impressive Nam Ha National Protected Area (NPA). 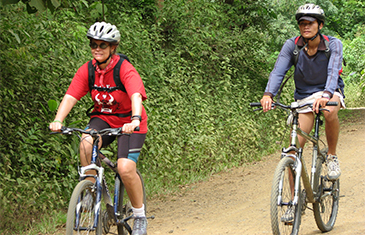 Beyond Luang Namtha, spend a full-day exploring the outlying countryside by bicycle. Pedal past soaring mountains, vast expanses of verdant green rice paddies and dramatic waterfalls. We make a stop at isolated villages that are home to the Black Tai and Tai Leu ethnic minority peoples. Witness how these communities hand-produce silk made with natural dyes, create lanterns and distil traditional Lao alcohol. There is ample time to visit a provincial market and That Phoum Pouk Stupa. Our kayaking journey takes us along the Nam Tha River, the artery of northwest Laos. Navigate a succession of exciting, but safe rapids, then disembark at Khamu village, home to the Ban Sop Sim Noy ethnic people. Leisurely paddle past everchanging forest types and see if you can spot some of the elusive wildlife here, including sun bears, tigers, barking deer and an impressive diversity of bird species. This is a unique way to experience the naturally diverse landscapes and flora and fauna of this remote region of Laos. Our riverine adventure concludes where the Nam Tha and Nam Ha rivers converge. Take the road from Luang Namtha to Huay Xai, driving through beautiful mountain vistas, stopping at several local villages of interest. We also explore Kao Rao Caves, near Vieng Phouka, an extensive cave system with limestone formations revealing old stalactites encrusted with crystal deposits. At Huay Xai, an important entry point, cross the Friendship Bridge that spans the Mekong River and connects northern Laos to northern Thailand. Continue onwards to Chiang Rai, a charming provincial city set beside the Mae Kok River, encircled by mist-shrouded mountains. Founded in 1262, the historical legacies of Thailand’s northernmost city are revealed in a fascinating blend of Thai and Burmese architectural styles. In Chiang Rai, we explore two contrasting temples, stunning Wat Phra Keo, the original home to one of Thailand’s most important Buddha statues and Wat Ruang Khun, known as the “White Temple”. Unlike most Thai temples, Wat Ruang Khun was built relatively new, in 1997, incorporating an all-white hue and modern-day symbols and figures. Continue on, travelling deep into the Golden Triangle, renowned for centuries as one of the world’s most prolific opium-producing areas. Nowadays, this naturally beautiful, mountainous region is a peaceful tourist destination. 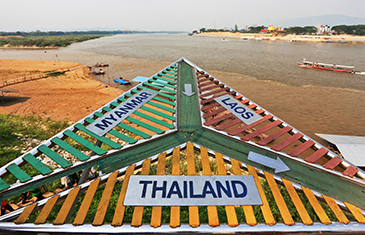 From a hilltop viewpoint, marvel at where two rivers converge to form the actual “triangle” of three countries – Laos, Myanmar and Thailand. Our visit to Mae Sai, a border town and important commercial hub, lends a rare opportunity to observe local hill-tribe folk engage in trade. Transfer to Chiang Mai International Airport for your onward flight. Our adventurous cross-border journey takes intrepid travellers from Thailand’s vibrant capital, Bangkok, up to remote north-eastern lands continuing into Southern Laos. Memorable days are filled with experiencing stupendous natural wonders, ancient cultural sights, fascinating local encounters and diverse landscapes, guided by local expert. Our adventurous cross-border journey takes intrepid travellers deep into the spectacular mountainous countryside of Northern Thailand and Northern Laos. This enthralling itinerary features several days cruising along the mighty Mekong River and engaging in authentic cultural experiences amid remote riverside communities.